Available Year Round So You Can Pamper Yourself With All the Comforts of Home! Thank you for your interest in our condos! We offer privately owned one, two, and three bedroom condos at Bay Point and Robinwood/Wrenwood Condominiums. Both complexes pride themselves on their clean, well-kept facilities. Each condo is privately owned and individually decorated and may have different bed set-ups and amenities. We will assist you in finding your perfect match! Relax on the spacious, private decks as you enjoy the view of the boats speeding by! There are convenient boat docks available for your use to swim, fish, or dock your boat. Boat slip rental is available in various sizes. Boat launch and boat rental are nearby. The condos are located only minutes away from numerous activities and restaurants by car or by boat. We offer a convenient office for check-in, check-out, and assist you during your stay. Daily maid service is not available. There is a NO PET and NO SMOKING policy for all condos. Book your condo directly with us and avoid the booking fees of the nationwide booking companies. Boat docks – great fishing! Bay Point is one of the finest, smaller condo complexes at the Lake of the Ozarks. They boast a beautiful, heated, lakeside pool that is wrapped around by a large deck with plenty of seating, and a panoramic view of the main channel. There is a parkette with a covered pavilion, picnic tables, and charcoal barbecue grills for picnicking. Bay Point also offers restrooms near the pool, four covered well-lit boat docks and wave breaks for boat protection. Wifi is available in all units. We have one, two, and three bedroom condos for rent at Bay Point. All are at the water’s edge and have great views of the lake from the living room, balcony, and master bedrooms. Robinwood/Wrenwood is also a wonderful condo complex within walking distance of the office. Robinwood/Wrenwood is located on the main channel in a protective cove. It has many great things to offer including two beautiful, heated swimming pools, two hot tubs, tennis courts, pickleball courts and a basketball goal. There is also a small children’s playground. They have 5 covered well-lit boat docks for your enjoyment. Boat slip rental is also available. Wifi is available in all condos. WE PROVIDE: One set of linens per bed; bath towel and washcloth per person; kitchen towels and wash clothes; initial set up of 2 rolls of toilet paper, 2 hotel soaps, 2 trash can liners and dishwasher detergent. Guests are responsible for replenishments during their stay. SUGGESTED ITEMS TO BRING: Beach towels; toiletry items such as shampoo and hair dryer; extra toilet paper, trash bags and bar soap; paper plates (for those of us that don’t like to do dishes! ); laundry detergent, coffee filters, any special item, such as a blender, that you may desire; and of course groceries. All condos are privately owned and the contents very to their individual taste. Copyright © 2019. 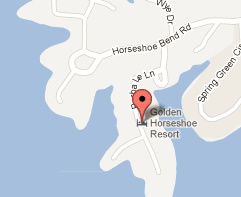 Golden Horseshoe Condo Rentals. All Rights Reserved.